Unfortunately, Bailey is no longer with us; she passed away a short time ago. Ash had Bailey's portrait painted as a gift to her Mom (also Bailey's Mom). Ash says of Bailey, "She was our Diva. We called her little bear because of the way she would grab onto things. She loved the cold and snow as well as stealing loose socks. Squeaky toys were her favorite and she always played with them when we were trying to watch a movie or show, like 'look at me!' Bailey was the most cuddly dog and always put a smile on your face. She will be in our hearts forever." From the photos that Ash sent me, I worked from a photo of Bailey on a colorful patterned rug looking up at the camera. This photo offered a great perspective of Bailey's sweet face and I loved the rug as the background. I knew the patterned rug would be painstaking and challenging - that is the nature of detailed patterns like rugs. A saving grace with the run was the little bit of variation in it; it is not a perfect, strict pattern like tile, bricks, etc. 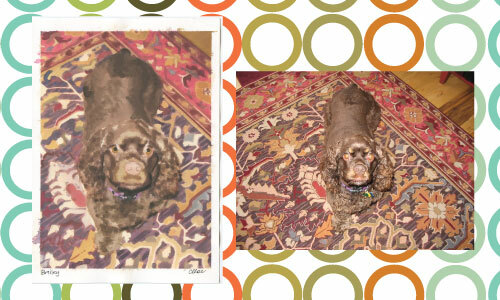 From the photo, I "zoomed in" on Bailey and made the 5x7" portrait be more Bailey and less background rug. I wanted to showcase the beautiful colors of the rug, but I wanted Bailey to take up the largest amount of the composition. 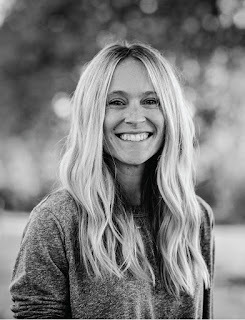 I love the way Bailey's portrait turned out. 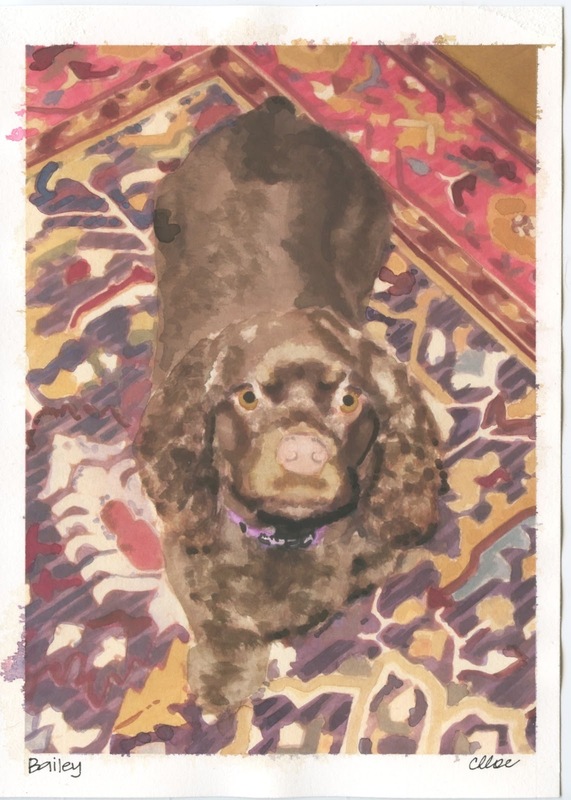 I feel like the curliness of Bailey's fur shows, and I love the way the color and pattern of the rug turned out. Rest in peace, Sweet Bailey. You did capture her curl... I wash thinking how much it looked just like cocker spaniel fur that I've known! The rug is just beautiful too!